1.- DESCRIPTION DIMENSIONS AND VOLUMES 1.1 DESCRIPTION •	The Hyperbaric Chamber OXICAB MO-13 is a chamber of the monoplace type, designed for medical treatments (therapies) of hyperbaric oxygenation in controlled conditions, in an atmosphere of medical oxygen at pressures up to 3 ATA. 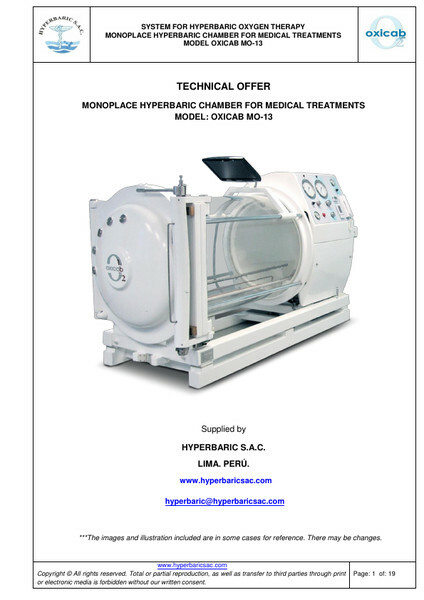 •	The Hyperbaric Chamber OXICAB MO-13 is a pressure vessel made of special steel, with horizontal cylindrical structure, with transparent acrylic tube section of 1,300 mm long and 900 mm. diameter, made of one single piece without seams or glue that allows the patient full visibility to the outside, reducing the feeling of confinement and providing comfort for its interior space. •	All the equipment, parts and pieces used in the manufacturing process are designated, certified and approved for its use especially in a hyperbaric atmosphere. •	Upon request of the customer, this model can be made with pressurization system with compressed breathing air and oxygen supply by mask. 1.2 DIMENTIONS AND MEASURES •	Material: Special Steel according to the ASME PVHO standard. •	Maximum treatment pressure: 3 ATA •	Pressurization with oxygen •	Material: Two sections, one of special steel and other acrylic tube. •	Exterior Diameter: 950 mm. •	Interior Diameter: 840 mm. •	Length of the acrylic tube section: 1300 mm. •	Length of the Steel section: 1,060 mm. •	Overall exterior length: 2,600 mm. •	Total height: 1,440 mm. •	Total width: 1,070 mm. •	Total volume: 1,6 m3. •	Approximated weight: 1,300 kg. •	Maximum working pressure: 3 ATA. •	Width of the stretcher: 750 mm. •	Length of the stretcher: 2,130 Mts.